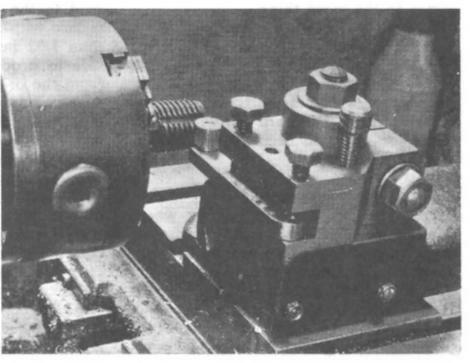 The images below shows a toolpost in use on a Myford ML7 from a book 'Using the Small Lathe' by L.C.Mason (4th impression 1975). Following this concept, I have designed and built my own quick toolpost along these lines. A central post, some 1.25 inches diameter, retained by the standard tool holddown bolt. This post has a flat bottom that rests on the topslide and is thus much more rigid than the bolt itself. 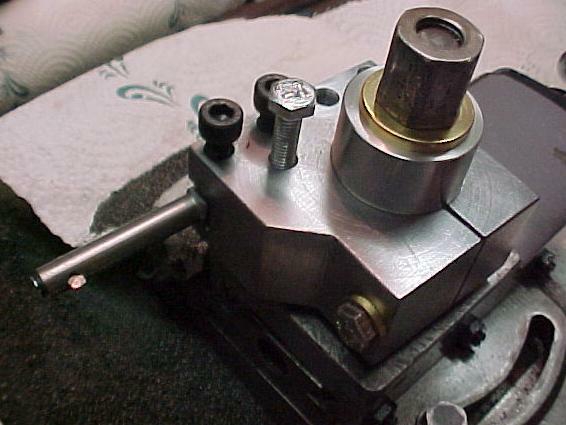 A height adjust bolt (just in front of the central post in the left foto) which sets the tool holders height above the topslide. In use, one can have just one such toolholder and change tools as needed with the advantage that packing strips are avoided. All height setting is done with the height screw and is very quick and easy. 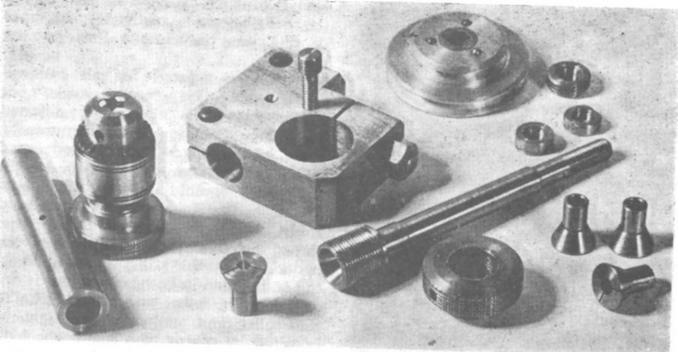 Alternately, one can have several such holders, each dedicated to a specific tool and preset to suitable heights. Simply loosening the crimp bolt (1/4 turn on mine) will allow the removal of the holder and the quick placement of the next one. 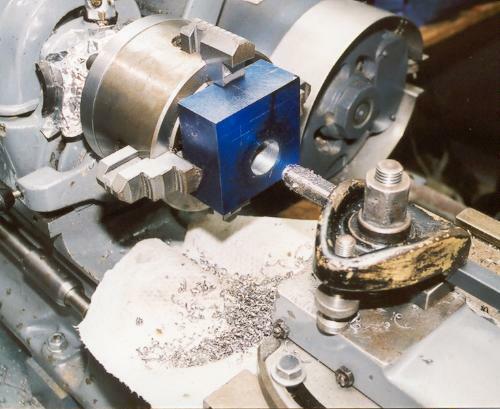 Variations can be made to hold boring bars or even drill/grinding attachments as illustated below. I already have partial drawings for a boring version, and a cutoff version, which might get mounted on a backtoolpost. The following is my final working drawing for the post I have built. This may undergo changes or updates as I gain experience with the prototype. A pack of printable drawing files is available as well. 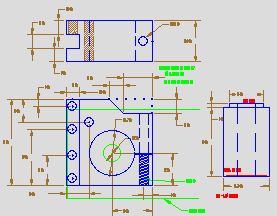 This PkZip2.5 archive contains Postscript, HPGL, PNG and TurboCAD2D format versions of the working drawing. You'll see that my post is offset the opposite way to the one in the foto, ie it overlaps the topslide toward the work instead of being recessed on that side away from the work. I don't know why the original was done so. 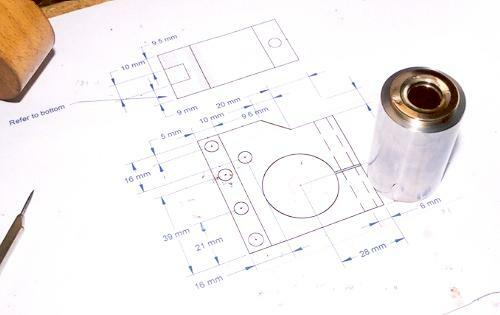 The author makes absolutely no mention of the toolpost except in the case of the milling spindle one. Thus I proceeded to design my own using my own reasons for what I did. I had a piece of stainless shafting handy and hacksawed off a suitable piece, then faced it both ends. In the drawing it is shown with a recess in the bottom end. This is to clear the 'hump' in the middle of my topslide where wear has not occured from 40 years of using the stock ML7 tool holder. Thus my post sits on the worn area at it's largest radius, and will sit flat and rigid. I made a brass washer to sit on top of the stainless, with it's inner edge chamfered to match the rounded end of the toolpost nut. In the photo you can see the brass is polished to a high gloss using a buff. Not necessary, but pretty. Stainless is not necessary, Mild steel would work just as well. 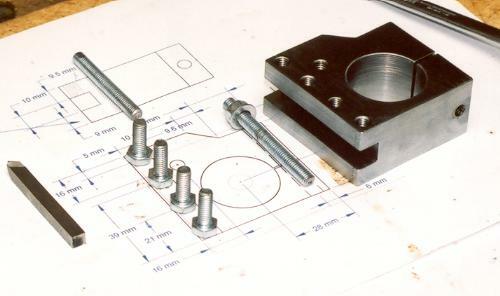 Making the tool holders can be quite quick if you have a mill or shaper. I don't and took quite a bit of time over milling it in the lathe. Being the first one and also the first time I've milled in the lathe, I took extra care. Next one will be much quicker. Mark out for the big hole. Mount in 4 jaw, drill and bore to a slip fit on the post. Mark and drill the clinch bolt hole. Drill the tool holding bolt holes, and the height adjust bolt hole. Tap bolt holes M6, tap clinch bolt hole M6 from outside end to just past the slot position. Saw slot. I used an ordinary hacksaw. Since the post is a slip fit, it does not take much to clamp it down rigidly. Counterbore the clinch bolt hole to 6mm, from the recess end. Mine goes from easily moving to rigid in a 1/4 turn of the spanner. 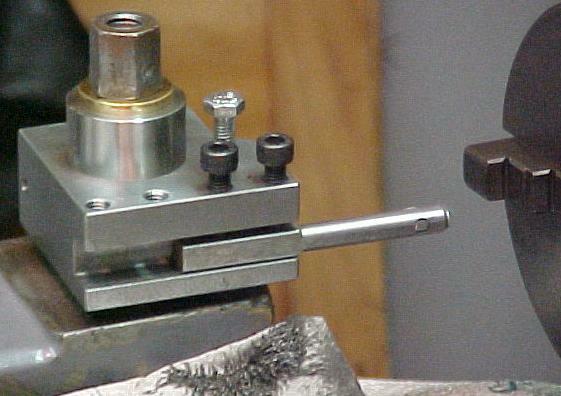 When I made the boring holder, I offset the tool slot lower in the block to accomodate my homemade 9mm thick boring bars. Having recently purchased some 8mm HSS tool blanks I decided to mill a little more off the bottom of the slot of the turning holder. 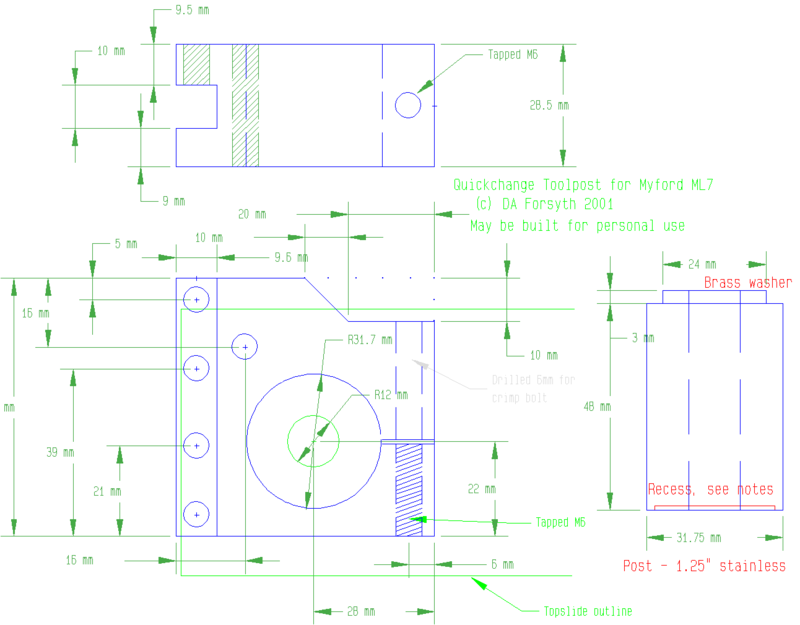 Thus the '9mm' dimension in the drawing becomes 5mm or so so that 8mm tools can be set to center height with a bit of leeway remaining. The completed post with it's polished brass washer. The post is 1.25" stainless shafting that had been gripped in a vice leaving marks which I cleaned up with a fine file and some 600 grip wet or dry. It was bored to 12mm to clear the bent topslide holddown post. The effect of the bend can be seen in foto 8. The almost completed block laid over the drawing. I've put the post in upside down so you can see the recess that clears the unworn 'hump' in the center of my topslide. This ensures that the post rests on the largest possible diameter and is therefore as stiff as possible and does not rely on the hold down bolt being stiff. The bar of 60x60mm BMS I cut the toolpost block off of with a hacksaw. Won't do it again in a hurry, rather take the time to go to a friend with a bandsaw! 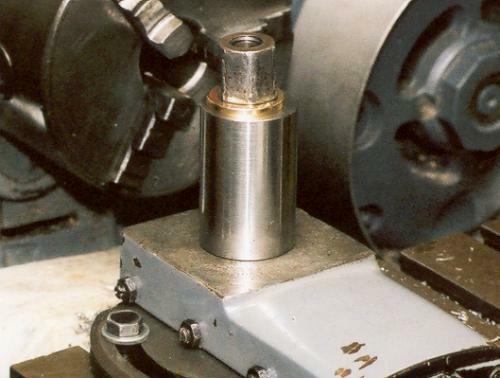 The endmill/slotmill just after filing and before hardening. This was made from a piece of a 1/2" 'silver steel'. It was turned to 10mm (the size of my required slot) then I made rough marks as guides, then cut the basic shape with a 1mm cutting disk in the anglegrinder. 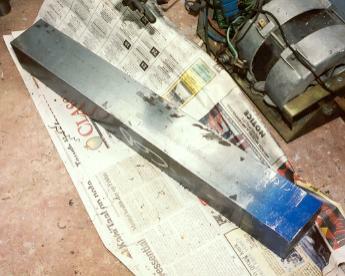 Then filed to shape. Heated to bright cherry with a LPG torch and quenched in oil. I then tempered it a bit soft and had to do it again before a final sharpening on the grinder. Ended up cutting slightly less than 10mm but it will do fine. The first couple of cuts! The block is mounted with the toolpost stud through the big hole. The topslide had to be mounted on the far end of the cross-slide for this operation, and you can see the rather makeshift method of holding the near edge down. The far edge has a T-slot handy. Fortunatly I made 2 T-nuts last year when I bought the lathe, they were one of my first projects but I've never used them till now. It was jolly handy to have them though, without having to make them for this job. Nearly there, another millimeter to go. This was a slow process since I could only take 5 thou cuts on one direction and 10 thou in the other. It was happier in the one direction only. Any deeper a cut and it would snag and unwrap the backlash in the crosslide leadscrew. The carriage was locked and infeed done with the topslide. The first cut! 30 thou in mild steel with power feed of 1.8 thou per rev and NO chatter, not even a hint. Could have gone to 40 thou I believe. As you can see I was too excited even to clean the blueing off before the foto! You can also see how the brass washer is off center. This is because the stud is bent from many years of tightening against the stock ML7 holddown. I had to bore the post slightly oversize to allow the post to sit flat with the stud running at an angle up the center. From the other side. The clamp stud end is still rough. This one is temporary allthread as I don't yet have a long enough bolt for it. I have since replaced the height adjuster and the clamp stud with M6x50 bolts which I polished on the buff. This makes the threads much smoother than they come from the factory and the action is nice and smooth. The fotos above show the boring version holding a short boring bar I made myself as described below. 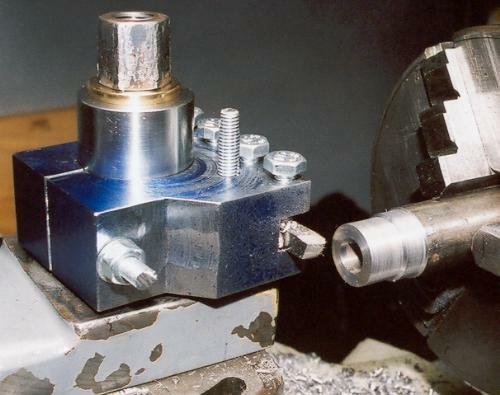 The basic tool holder is simply flipped over so that the tool is supported by the overhang toward the work. You'll see that the slot is lower than in the 'normal' holder as this one must accept 3/8 tooling and bring it to center. 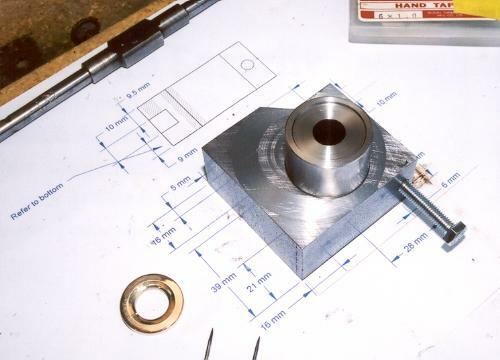 My normal holder is sized for 1/4" (6mm) bits which is what I normally use though I am considering remilling it to take 3/8" cutters. Of course I had to bore this tool holder using the normal toolholder which worked quite well with the 3/8 boring bar shown below. 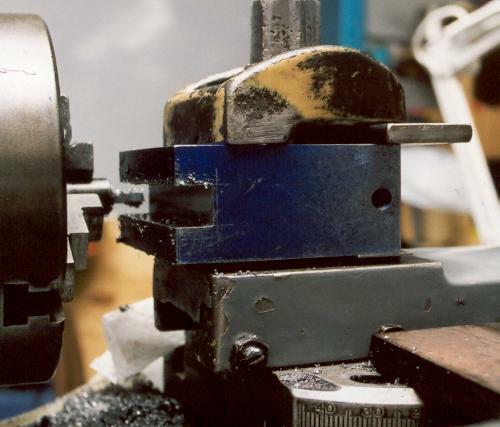 This is a bar of ordinary hot rolled steel drilled through the end to take the 1/8" HSS center drill reground to a 'left hand knife tool' sort of shape. It is retained by a 4BA bolt threaded into the end of the bar. The screw hole was used as the center (and it's actually off center simply because it was 'just drilled' by eye in the press) when I turned the corners off to provide clearance in starting holes. The smaller bar seen above is made from the bar that links door handles through the lock. The cutter there is a piece of ball bearing casing sliced from the outer race using a 4.5" angle grinder and 1mm thick cutoff disk, then ground to size and shape on the bench grinder. Keep it cool! 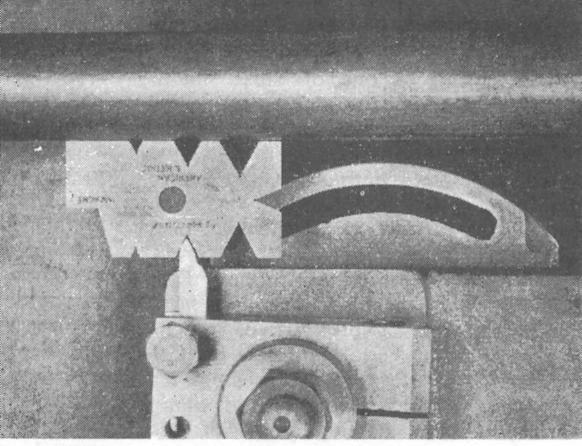 The cutter is retained by an M3 countersunk screw in the end of the bar. (because I recently purchased a set of M3 taps and had to use them for something!). This bar will enter a 10mm hole whereas the longer one will only enter 13mm. 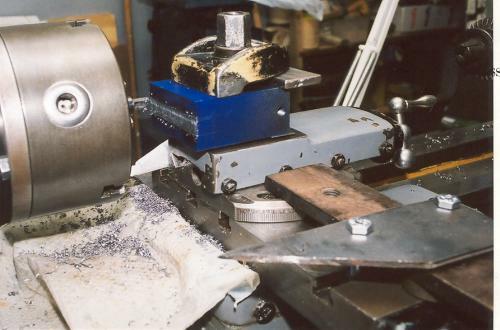 The squarish hole is for a cutter as described above that I ground too short after many resharpenings and replaced with the HSS center drill. I will be cutting the tail end off as soon as I need to. For the job I needed this for (the final few cuts on the boring holder) it fitted into the hole as is. The end of the bar was ground off so it didn't hit the jaws in the 4jaw when I was boring the tool holders. 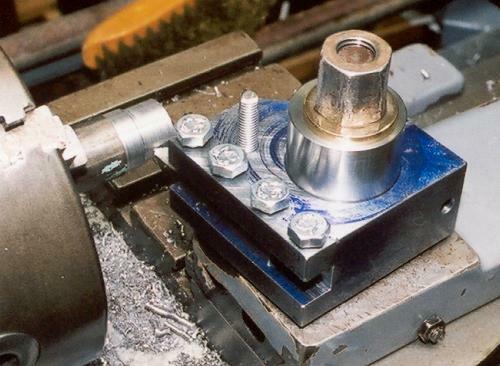 The holder could easily be made with the tool holder bolts on the other side so that it can be better used for boring tools with the recessed side next to the work, and hence also the overhang supporting the tool in that side. The recess could be left out, and the clinch bolt operated from the operator side (also tap the opposite end of the hole! ), but that would interfere with facing operations so this is only feasible if another holder is available for facing/boring. Toolpost grinders, drilling rigs etc could be made with this mounting. Even a rear toolpost with this same post on it could be made, facilitating easy tool swapping and adjustment. Last modified: February 20 2013 07:52:55.